Is it ok to wear a ... to ... ? X means no. Ã‚Â O means yes. Ã‚Â A ^Triangle^ means maybe. This list is by no means encompassing, but it should answer a lot of questions on kimono-wearing in Japan. Ã‚Â It's up to you to decide if pertinent. I'd like to point out that an iromuji or nice komon is probably the most versatile piece for this list of events. The least versatile? Kurotomesode. The "triangle" is common in Japan to mean it's an ok answer, but not the best. That's for the "O". Ã‚Â So it's better to wear one that's got a "O" next to it, but if you don't have that type of kimono, it's ok to wear the one with a "triangle". Thank you for sharing as well! There's some soudou charts I keep meaning to translate but haven't gotten around to doing yet. Once I do, I'll add them here! Practice might mean anything from Kitsuke practice to dance or music lesson practice (like koto or shamisen or something). Seems to work with what I've seen from my limited dance lessons.Ã‚Â Would it follow for tea ceremony practice, too? I've never gone, so I don't recall what others said they wear for lessons. I imagine for kitsuke practice you wear what you have; furisode would be ok if you were learning to wear that (but most women who get interested in kimono are past furisode age anyway). We had the range in my class, from kurotomesode (when someone was preparing for a wedding) down to yukata. I've seen my tea sensei wear a very elegant muji tsumugi to a tea demonstration. Tsumugi is usually more casual, but obviously the solid colour kicks it up a notch in the formality department! Interesting that muji tsumugi gets its own category here. In my experience, women usually wear komon for tea practice (okeiko). My guess is that "practice" here refers to instructional lessons in such things as tea, ikebana, koto and so forth - although I suppose kitsuke practice could be included too! Iyolin - To me the X/O/triangle didn't needed translating when I made the chart, but the Yes/No/Maybe was to head off any questions in posting. Of course, the distinction between Good/OK/Not so Good is so subtle. Never saw a tringle on my Japanese-corrected papers though. I do have one more chart from the same issue about materials to wear during each month. Only half-translated. Yes, they used o-keiko for practice. But most people don't dress themselves in furisode, right? It's always dressing a dummy or another person. I'm thinking furisode are designed so that a girl cannot (or should not) dress alone. seoulstar74 wrote: I'm confused about one part, though. It says that furisode are not appropriate for grauduation ceremony. What do girls wear to graduation then? I think this chart is more for those who are attending the graduation ceremony, not those who are actually graduating. claw789 wrote: Iyolin - To me the X/O/triangle didn't needed translating when I made the chart, but the Yes/No/Maybe was to head off any questions in posting. Of course, the distinction between Good/OK/Not so Good is so subtle. Ã‚Â Never saw a tringle on my Japanese-corrected papers though. I never got triangles on my Japanese-marked papers, either. It was either right or wrong. I learned about it only when I started marking papers in Japan for English classes. Sometimes there's an answer that's ok, but it's not the best answer or the one they're supposed to be using. Answer the question: "What are your hobbies?" Maru/Circle answer: "My hobbies are reading and sewing." I remember getting my first test back in Japanese, and spazzing when it was full of circles! Only afterward did we realize that the circles were good things, and not circling mistakes, like we do in Canada (or at least, like I've had experience with). Agreed that the differences can be very subtle, and sometimes only those who have studied for years can tell the difference or know when it's ok or how to make the outfit more acceptable. Ã‚Â I always feel as if there's so much more to learn! I've seen some tsukesage that almost look like sparse komon, to me. It really doesn't feel terribly formal to me at all, especially if it were paired up with a simple nagoya obi in a muted colour. I suspect they meant things like this, moreso than say something like this one with the bright colour and gold embroidery. I was thinking that that's maybe part of it. Ã‚Â But, I was also thinking maybe with mon and un-mon. Ã‚Â But, I still can't get my visual to think of tsukesage as anything less than semi-formal or formal. The reason I ask is I want to buy a bolt from ichiroya - which I think on that thread someone said it was about $140-$180 for hitoe? - because, my boyfriend is thinking, now, about going to Japan for a year... damned loop holes... any way, he's thinking of graduating from TUFS in Tokyo. I thought it had to do with crests, but I don't really know. I've always kind of thought of my tsukesage as "casual" tsukesage since it's un-crested...it's this one (I'm sorry I haven't saved Ryujiro's photos). The material is synthetic, and there is some gold dye in the pattern but it strikes me as "modern" rather than "formal" (if that makes sense). Of course, I still treat it as my formal kimono ;) but I'd imagine it's about as casual as a tsukesage can be. Hay I am trying put together a ensamble for my husband to wear to the local renessance festival with me. But I was not sure If it would me more approprate for him to wear casual with just a haori over his kimono or would it be more approprate for him to wear hakama as well. To answer your question, though, a kimono with a haori and without hakama is appropriate for casual events, like parties or dinners out. It's probably also acceptable to wear just a kimono and obi, if the weather is hot. Of course, if the weather dictates, a yukata would be more than appropriate for a Renn Fest, since yukata are specifically summer festival wear. Shinobu wrote: I thought it had to do with crests, but I don't really know. I think houmongi and tsukesage are never crested. I own several "casual" and one that is covered in silver work - no crests on any of them. Question, aren't houmongi by definition kinda traveling outfits as you are going to visit relatives or friends in your best "visiting kimono"? I'm pretty sure houmongi can be crested; probably tsukesage, too, but I haven't saved any pictures, so I can't provide any proof. I'll try to keep my eyes open next time I shop ebay or something. Re:houmongi - are you referring to the last column, which is "travel"? Since the kimono listed are all relatively informal, I assumed travel to mean something like, taking the shinkansen to or from Tokyo [or elsewhere], or going out for a drive to see the leaves change, or taking a several-hour bus ride - something like that. More along the lines of actually spending significant time traveling as opposed to going somewhere to visit someone for something in particular for a short time (like a stop by for tea or whatever). Tahanala wrote: I do have crested tsukesage, and even crested edo-komon. However, I don't have any pictures to provide, sorry! It would be interesting to know if there are any rules to when tsukesages and houmongis are crested or if it is just personal or artistic preference. Maybe if the owner bought it for a family occasion like a wedding it comes crested. If bought for a formal party etc., maybe no crests? Cause like I said I own the one of the most elaborately decorated houmongis I've ever seen and there is not even one crest. onnagata wrote: I do not know if I have seen right, but I watched an enka video where the female shamisen players all wore kurotomesode. I know for formal performances, it's not uncommon to see western orchestra members in tails and gowns. Could this be similar? I believe it's the same sort of thing. Performers often dress quite formally; for example, I've seen a gentleman play Tsugaru Shamisen in the middle of winter (Feb) outside in black crested kimono and striped hakama. I've heard from lt.dead as well that when she performed shakuhachi, the men were in very formal wear. I don't think it always holds true, though; I've seen several pictures of koto players in iromuji (mostly pink), not kurotomesode. I don't know if it's instrument specific, venue related, or up to the performer. But I think it is related to the same thing, yes. Kurotomesode are sometimes worn for performances in addition to weddings. The two ladies in kurotomesode are both nihon buyo dancers, by the way. Not sure it makes a difference, except perhaps the hakata-with-kuro style. I'd never been to this event before, but as a careful student of every TPO chart available on the internet (my thanks to Claw789 and others), I wore one-crest iromuji with a fairly formal nagoya obi in otaiko musubi. (The Kimono Duet outfit.) Houmongi was clearly the most-appropriate common denominator, but the socially-acceptable range was pretty wide. She wants to take Andrew to tea ceremony when he's in Japan. She wants him to wear kimono etc. I told her my concern is that Andrew's Oshima tsumugi I bought him isn't formal enough. Her response "Oshima tsumugi is ok. Really, not many Japanese care so much about wearing or not wearing tsumugi places." Andrew should be fine in tsumugi. It is much more acceptable for men, and even perhaps the norm of kimono for men. Most people are clueless about tsumugi, and there are even tsumugi houmongi of all things! I would think that one would only need to take heed about wearing tsumugi in Kyoto, and even then only if around people knowledgeable about kimono. For Omote-senke tea, tsumugi is also unacceptable, but it would be rare to attend an event of this school. I don't even think they have public events for non-members. Follow-up: I've seen the lady in the komon that could have been tsukesage-komon since then, and a) the kimono is komon, and b) she is also a dancer, and wore it to dance the day I saw her. It's dawned on me that the dancers might have performed earlier in the afternoon on the emperor's birthday. That might throw off the TPO for any or all of those ladies. It's not the be-all-end-all, but it does take a different approach in determining which kimono would be best for which occasion, which is to start with the event and then decide on the kimono. 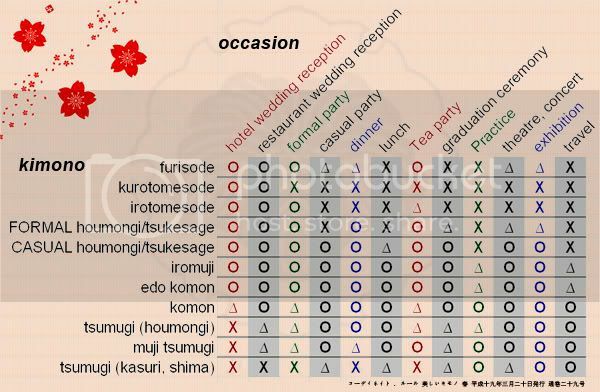 I found another chart concerning the Kimono's occasion formality. For women and men. That's interesting because it seems to be suggesting that men can wear heko obi with informal kimono as well as yukata. Wow, that cleared a lot on my mind. I was thinking about my furisode and if I could wear it for semi-formal dinners/parties. I guess I can if it's a triangle. Thanks for sharing! would it be ok to wear tsukesage to a tea party if I'm 30, single and look 21 (or 14 for US)? That puzzles me because in theory tsukesage is for married women and I should wear furisode for any occasion right? muhvi wrote: I don't think tsukesage is for married women only, I believe this goes only for kurotomesode. I thought that aswell,, then houmongu would be for married women aswell? A long time ago, single women would have only worn furisode. But now, furisode is relegated to ceremonial occasions only. A single woman would be ok to wear tsukesage or houmongi for a more formal occasion. And about furisode, can I even wear it? I mean, going by tradition, I'm single but older even though I look younger. Furisode is beautiful obviously and I really like the vivid patterns on them. I always wonder if I'm too old for them and if should go for kimono appropiate for my actual age or the age I look. I worry about looking childish or like a child playing with her mother's clothes (which is how I feel I look with a western suit any way).